Oh no! The Illuminae Files are done. I am already missing them. I loved every part of them, only a few things about the end of it I didn’t like. Amie Kaufman and Jay Kristoff are amazing writers and I would love them to pair up again. 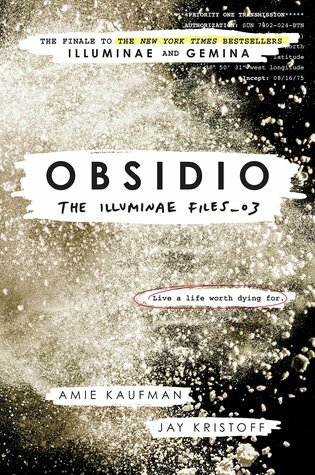 I give Obsidio by Amie Kaufman & Jay Kristoff five out of five hearts because it is a great read. Not only as part of The Illuminae Files, but also as a separate book. Obsidio is a great end to the series, the part of the novel happening on Kerenza IV is a great story by itself. About selfsacrifice and loyalty. But the part of it that happens in space is great addition to The Illuminae Files. It is fast paced and intense. Again the book is written as emails, drawings, audiologs etc. It was super epic. I was really worried because it is very hard to write a satisfying end to such a hyped series. But I do think the series had gotten another part to write the end of it all coming together. It is great the way it is but could have been even more epic if it had been one book more. The biggest issue I had with the story was the fact that Amie and Jay didn’t kill of some of the characters we were saying goodbye to during the last bit of the book. Of course it great to have that surprise, but everyone of the main characters survived even though we sort of knew they wouldn’t survive. I have issues with this kind of writing because it is not really surprising anymore when it has been done before, like in Illuminae. The characters are witty and fun while in this harsh situation, just like in the other novels. It keeps the intense story more fun and lighthearted. All the story lines are concluded and nothing feels undone. AIDEN is a great addition to the cast and his choices have been judged very harshly even though he just does what he is programmed to do. I really wish everyone would pick up The Illuminae Files. It is a great series with little bad points. Every book sorta has it’s own main characters (Kady & Ezra, Hanna & Nik and Asha & Rhys), but they also come together to conclude each novel properly and have each of the main character’s books join together. This entry was posted in Book Review and tagged Amie Kaufman, Book Review, Drama, Jay Kristoff, Mystery, Romance, Science-Fiction. Bookmark the permalink.